One of the great fabrications of Western mainstream media, among academics and on Wall Street is that China, starting in 1978 with Deng Xiaoping’s economic reforms, became a capitalist country. The favorite Western shibboleth bandied about is that, China’s authoritarian regime (it’s almost never called a government) runs a system of state capitalism. This is said with a genuflecting air of superiority and righteous consternation, because it’s not quite copacetic; it smells like warmed over chop suey. State capitalism is supposed to mean that China’s leaders, whom I collectively call Baba Beijing, map out grand national plans and mandate to China’s businesses what they are to do and not to do, whether they like it or not, markets be damned, and tax incentives and subsidies are offered to push them in the desired direction. This so called state capitalism is considered to be inherently unfair, since Western capitalism mythically only responds to the needs of “free markets” and the “free movement” of capital, investments and goods across our Planet, in search of profits. The self-reassuring message is that China is fully in fold of Western capitalism, except Baba Beijing plays dirty, using its own set of rules. Keeping it in the rubric of capitalism justifies why China has become, in just one generation, the world’s largest economy in purchasing power parity (PPP), eclipsing the United States for the first time since 1872, when America’s rapidly expanding colonial empire overtook China’s centuries-held #1 position. During the last generation, China has become the world’s #1 manufacturer, exporter and cross border trader, as well as Planet Earth’s largest creditor. During this time span, Baba Beijing’s policies have created the world’s largest and still fastest growing middle class, bringing a materialistic lifestyle to 1.3 billion citizens. This superficial image of the Chinese buying Stuff and Fluff, just like super-consuming Westerners, further gives outsiders the impression that China is just a copycat, eastern version of crass Americana. During this same time frame, 1949-1978, the United States garnered 8% annual growth, just one percent more than the communist-socialist model. Given that the United States and its NATO supplicants successfully shut out China from international finance, investment and trade, until the mid-70s, the Mao Era economic statistics are truly remarkable. With the advent of Deng Xiaoping’s reforms and opening up China’s economy to do battle with Western capitalism (the Deng Era, 1979-2012), China’s economy has grown an average of 10% per annum, while America’s growth averaged 6%. 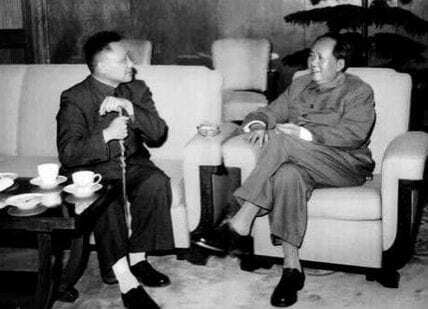 A not-well-known point of history is that many of Deng’s reforms were actually started by Mao, Deng and Zhou Enlai, going back into the 70s and 60s, which helps explain the Mao Era’s phenomenal socioeconomic achievements. 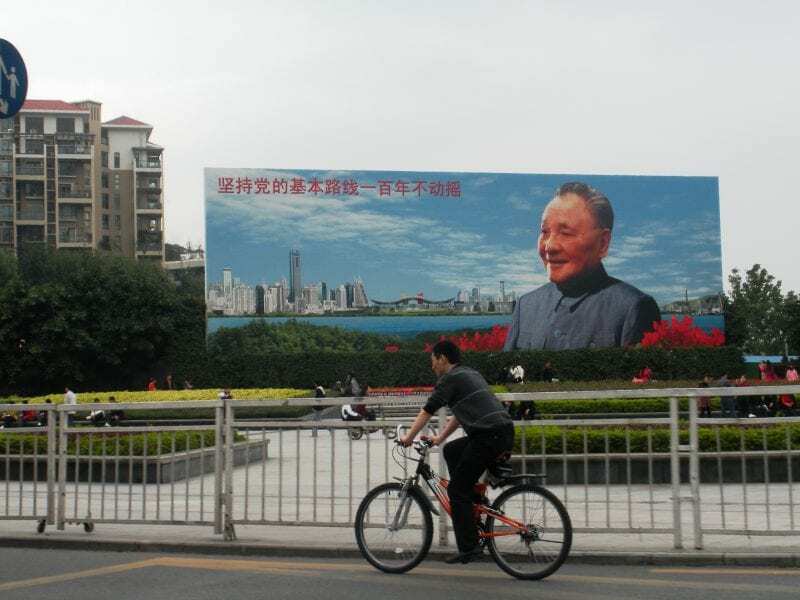 These earlier reforms were cleverly rebranded as “new” by Deng. Western capitalists eagerly lapped it up, in their lustful pursuit of Chinese profits, starting in 1978. China’s amazing socio-economic success story during the Mao Era has been completely expunged behind the Great Western Firewall. 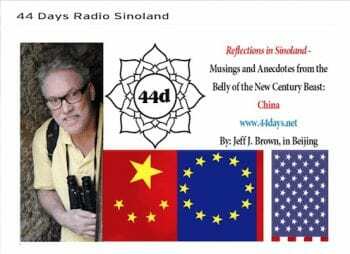 https://www.greanvillepost.com/2015/06/16/radio-sinoland-mao-zedong-ow-or-wow-2015-5-1/ For Western colonialism, it must not become common currency that a once poor, technologically repressed country of China’s size, any size for that matter (think Cuba or Eritrea), can succeed economically and socially, under the banner of socialism and communism. It is for this reason that there is a relentless foghorn of Western propaganda to discredit any and all gains made by non-capitalist countries. The West’s owners surely don’t want free thinking people and their leaders in Africa, the Americas and Asia to get any radical ideas. These imperial lies have continued into the Deng Era. China is still a communist and socialist country. Baba Beijing has simply used the West’s methods, markets, investment and technology to continue to advance the wellbeing of China’s people, within its non-capitalist economy. This is hard for most Westerners to wrap their heads around, that China has been and continues to be a communist and socialist country, till now, 2015, and will continue to be so as long as Baba Beijing is in power. This explains why the West has been relentlessly trying to overthrow the Communist Party of China (CPC), since liberation in 1949. After the founding of the People’s Republic, the transition of Chinese society from a new- democratic [Editor’s note: China’s first republican period, with Sun Yat-Sen, 1912-1949] to a socialist society was effected step by step. The socialist transformation of the private ownership of the means of production was completed, the system of exploitation of man by man eliminated and the socialist system established. The people’s democratic dictatorship led by the working class and based on the alliance of workers and peasants, which is in essence the dictatorship of the proletariat, has been consolidated and developed. The Chinese people and the Chinese People’s Liberation Army have thwarted aggression, sabotage and armed provocations by imperialists and hegemonists, safeguarded China’s national independence and security and strengthened its national defense. Major successes have been achieved in economic development. An independent and fairly comprehensive socialist system of industry has in the main been established. There has been a marked increase in agricultural production. 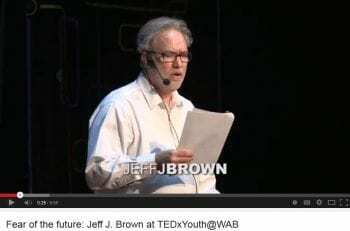 Significant progress has been made in educational, scientific, cultural and other undertakings, and socialist ideological education has yielded noteworthy results. The living standards of the people have improved considerably. 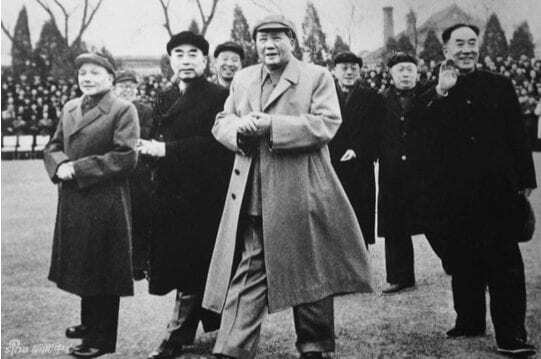 Both the victory of China’s new-democratic revolution and the successes of its socialist cause have been achieved by the Chinese people of all nationalities under the leadership of the Communist Party of China and the guidance of Marxism-Leninism and Mao Zedong Thought, and by upholding truth, correcting errors and overcoming numerous difficulties and hardships. The basic task of the nation in the years to come is to concentrate its effort on socialist modernization. Under the leadership of the Communist Party of China and the guidance of Marxism- Leninism and Mao Zedong Thought, the Chinese people of all nationalities will continue to adhere to the people’s democratic dictatorship and follow the socialist road, steadily improve socialist institutions, develop socialist democracy, improve the socialist legal system and work hard and self-reliantly to modernize industry, agriculture, national defense and science and technology step by step to turn China into a socialist country with a high level of culture and democracy. The exploiting classes as such have been eliminated in our country. However, class struggle will continue to exist within certain limits for a long time to come. The Chinese people must fight against those forces and elements, both at home and abroad, that are hostile to China’s socialist system and try to undermine it. 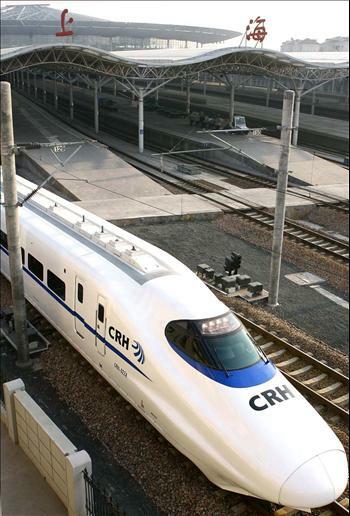 One of China’s fast trains. The nation’s infrastructure is being rapidly modernized, while in most of the West, especially in America, the ruling private sector neglects public works and investments that benefit the masses. China’s constitution clearly states that the Chinese people will govern themselves via their people’s democratic dictatorship. This dictatorship will guarantee the integrity of the People’s Republic of China as a socialist state. This simply means that China’s citizens invest in the CPC to represent them and act on their behalf. Among the Chinese, this faith in their central government to do the right thing, protect the citizens, their livelihoods and the country’s borders, is called the Heavenly Mandate. The Heavenly Mandate is a unique, sociopolitical concept that includes all previous emperors and dynasties, going back 5,000 years. The Heavenly Mandate stipulates that if the current Baba Beijing does not take care of the people’s business, it will be replaced with a new one. The other key philosophy stated in China’s constitution is that the CPC is authorized to use dictatorial powers to vanquish any anti-revolutionary imperialists and hegemonists (Westerners) and fight the exploiting classes (meaning capitalists), both inside China (fifth column compradors) and outside China (Western empire), who are all trying to overthrow the CPC (via Western international institutions, NGOs and internal and external psyops/blackops subversion). Chairman Mao did very good things. Many times he saved the Party and the state from crisis. Without him the Chinese people would, at the very least, have spent much more time groping in the dark. Chairman Mao’s greatest contribution was that he applied the principles of Marxism-Leninism to the concrete practice of the Chinese revolution, pointing the way to victory. It should be said that before the sixties or the late fifties many of his ideas brought us victories, and the fundamental principles he advanced were quite correct. He creatively applied Marxism-Leninism to every aspect of the Chinese revolution, and he had creative views on philosophy, political science, military science, literature and art, and so on… We won great victories for the revolution precisely because we adhered to Mao Zedong Thought… We will reaffirm that his contributions are primary and his mistakes secondary. We will adopt a realistic approach towards the mistakes he made late in life. We will continue to adhere to Mao Zedong Thought, which represents the correct part of Chairman Mao’s life. Not only did Mao Zedong Thought lead us to victory in the revolution in the past; it is — and will continue to be — a treasured possession of the Chinese Communist Party and of our country. 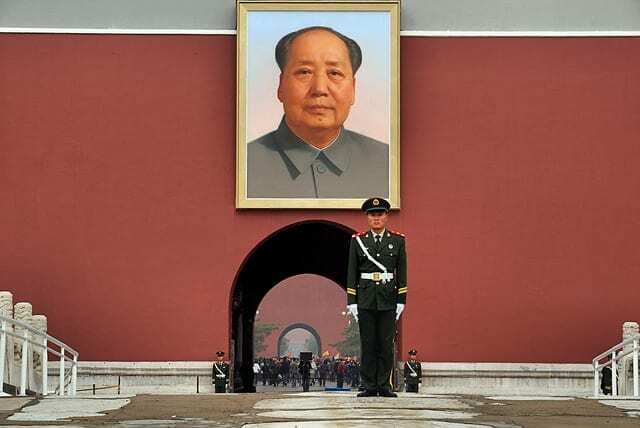 That is why we will forever keep Chairman Mao’s portrait on Tiananmen Gate as a symbol of our country, and we will always remember him as a founder of our Party and state. Moreover, we will adhere to Mao Zedong Thought. We will not do to Chairman Mao what Khrushchev did to Stalin. Best as I can tell, there is not much market oriented liberalism to tease out of Deng’s statement. The world has now entered China’s third great modern era, President Xi Jinping’s, starting in 2013. Xi did not get a PhD in Marxism-Leninism, upon which is based Mao Zedong Thought, for nothing. He is mobilizing China’s people with his highly popular Chinese Dream, to achieve a moderately prosperous, socialist society, thereby rejecting mindless consumption. This is the antithesis of America’s gluttonous, greedy, self-centered me-ism. The Chinese Dream also fully encompasses the goal of living in a clean and safe environment. 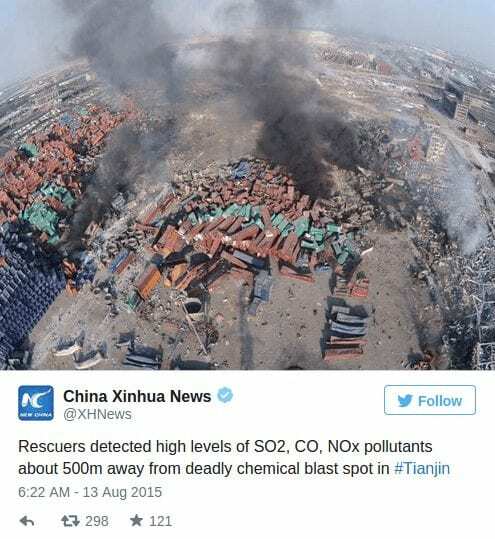 Xi knows that all these capitalist adoptions in China have badly degraded the air, soil and water, as well as making it the world’s poster child for unsafe work conditions, as the Tianjin port explosion and numerous mining accidents can attest. Poll after poll shows that the people’s democratic dictatorship is clamoring for Green, Clean and Safe. If Baba Beijing does not address its citizens’ demands, it could quickly lose the Heavenly Mandate. Baba Beijing will undoubtedly use the Tianjin port disaster as an administrative cudgel to push through more costly and stringent workplace safety legislation. The owners of the port storage company, Ruihai International Logistics, will surely face capital punishment or spend the rest of their lives behind bars. The fact that Ruihai is not a government owned company also gives Baba Beijing a powerful bully pulpit to tout the benefits of state owned enterprises, and they may use this tragedy to forcefully buy out privately held companies that are working in high risk fields. A big sign that China is still communist-socialist is that Baba Beijing is going in the opposite direction of Western colonialism, by rolling out a massive, nationwide social security and retirement program for anyone living here, even foreigners, if they pay payroll taxes. This ambitious initiative also includes universal health care for everyone, especially children, the elderly and infirm. Meanwhile, the West is working furiously to dismantle its social and medical programs, or at the very least, making them much more expensive for its citizens, as well as looting many billions of dollars and euros from pension funds. Xi Jinping and the CPC are also fully committed to bringing China’s 90 million poorest citizens out of extreme poverty, by 2030. This, while the West can’t defund and cancel fast enough what’s left of its sundered safety nets, for society’s most vulnerable. Xi is one of the world’s most powerful leaders. Yet, he regularly underscores this government mandate to the press and the people, even traveling to pockets of severe poverty, to drive home the point. The last US president who openly talked about poverty was Lyndon Johnson, and that was 50 years ago. As a country founded on communism and socialism, I’ve never heard a Chinese citizen complain about the less privileged taking what they should rightfully keep as “their own”. The idea that China’s worst off are economic leeches sucking off “hard working citizens” is unimaginable and repugnant here. China is still very much communist, because every square meter of this country is owned collectively by the Chinese people, via the state. No one can buy the dirt under any piece of property. All one can do is have a long term lease, which by legislation, cannot exceed 70 years. For foreign businesses, this is quite acceptable, since there are very few capital investments, if any, that are not fully depreciated off the books in less than 50 years, most in 5-20 years. Anybody on Planet Earth can invest in China’s real estate, but if you wish to keep it longer than 70 years, you will have to renew your lease contract and pay its going market value, to do so. This is what China’s constitution means that, “The socialist transformation of the private ownership of the means of production was completed”, meaning the entire country’s landmass was nationalized. Baba Beijing is continuing to try different ways of making the country’s land more productive, via creative laws and regulations, but it is still all collectively owned, every square millimeter. The fact that China’s lands are collectively owned is suppressed behind the Great Western Firewall, because it is inconvenient that such an incredible, communist-socialist economic success story, is a proven fact. Only “private ownership” can assure the happiness and wellbeing of the people, or so goes the myth of Western capitalism, as peddled by Adam Smith and Francis Bacon. In reality, Smith and Bacon were only concerned with the prerogatives of the elite one percent. 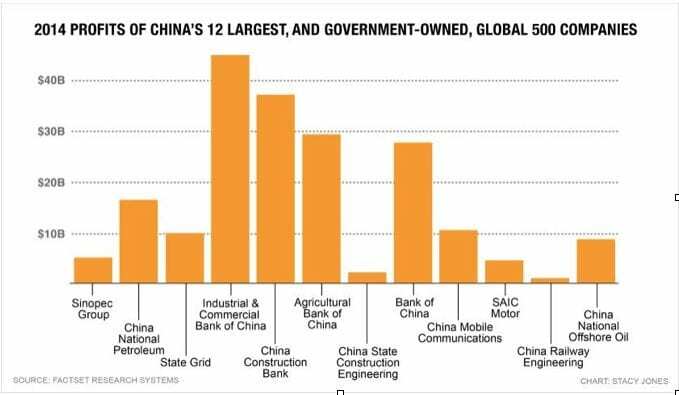 China’s state sector, meaning government owned businesses, dominates the national economy, and its presence is being felt, more and more, across our Pale Blue Dot. 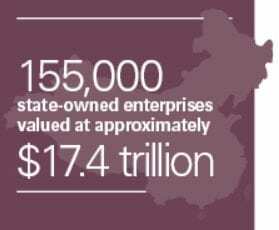 There are 155,000 state owned enterprises (SOEs) in China, in every imaginable sector and industry. Their book value is US$17.4 trillion, more than America’s annual GDP. Since the 1990s, China has been and continues to adopt capitalist practices to make its SOEs perform better and be more transparent. A number of them are selling a portion of their ownership to the public, by listing shares on Chinese stock markets, keeping the vast majority of ownership in government hands, usually up to a 70% government-30% stock split. This sort of shareholder accountability has improved the performance of China’s SOEs, which is Baba Beijing’s goal. Some of the bigger SOEs are splitting off sector specific businesses and then selling minority stakes in them on the stock market, to allow these new entities to focus their specialized energies, compete on the national and world stage. Conversely, other SOEs are being consolidated to become planet conquering giants, in the energy, commodities, transportation, infrastructure and communication sectors. Thirdly, SOEs are spending billions of dollars and euros all over the world, buying outright or investing in stock traded companies, to add to their bottom line, ironically now making them government owned under the SOE rubric. The bigger they are, the more profitable they tend to be. On the capitalist sacred list, Fortune’s Global 500 Companies, http://fortune.com/global500/ China’s socialist behemoths are more and more competing head to head with the West’s most successful, stockholder corporations. In 2000, China only had 10 companies listed on this capitalist Holy Grail. By 2010, the count was up to 46 and this year, 99. Only 22 of these nearly 100 Chinese companies are majority shareholder owned. All the others are proudly flying the flag of China’s people’s democratic dictatorship. How profitable are China’s government owned corporations? Last year, China’s 12 biggest SOEs on the Global 500 list made a combined total profit of US$201 billion. http://fortune.com/2015/07/22/china-global-500-government-owned/ China’s democratic dictatorship owns the world’s largest petroleum company (SINOPEC- bigger than ExxonMobil, BP and Shell), the largest bank (ICBC- bigger than Citibank, HSBC and Bank of America), the largest utility business (State Grid- bigger than E.On and Eléctricité de France), the largest construction engineering firm (China State Construction Engineering- bigger than Bechtel and KBR), the largest railroad business (China Railway Engineering), the third largest telecomm outfit (China Telecommunications), the sixth biggest insurance group (China Life Insurance) and the tenth largest automobile manufacturer (SAIC). The Chinese people own four of the world’s Top Ten banks and two of the five largest petroleum concerns. Other sectors that are state monopolies or dominated by SOEs are airports, arms and weapons, banks, dams/hydroelectricity, insurance, ports, tobacco, solar and wind power and toll roads and bridges. The economic model that the West cannot bring itself to admit is truly succeeding. The hen on the left is state owned assets. 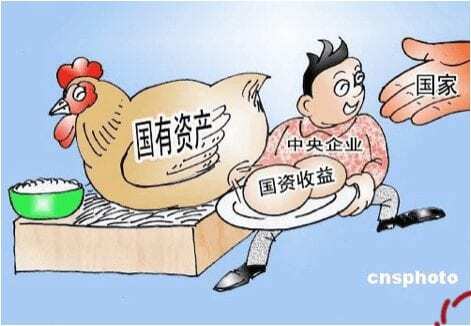 China’s SOEs are represented by a successful boy, who is handing state income eggs to the country and its commonwealth: the people’s democratic dictatorship. (Image by cnsphoto.com). Well, I should hope so, because China’s economy is communist-socialist, and not at all capitalist. This World Bank gaff of conceit was extirpated from the report a couple of weeks later, with the lame excuse that it had not been “adequately reviewed” before publication. The fact of the matter is, this was a classic Freudian slip, which accurately mirrors Western Empire’s true fears. Why? Because China’s economic performance has, since 1949, beaten the pants off of “unfettered, free market” America – by a long shot – and China’s superior communist-socialist model will increasingly outpace Western colonialism, as it slowly collapses into irrelevance. This is what truly frightens Western colonialism to the quick. With the advent of China’s communism-socialism rising up as an alternative to the West’s 1%-99% system of exploitation and resource extraction, imperial propaganda has been relentless in brainwashing its citizens, to deny this model’s existence and discredit its many successful examples around the world. Instead of America and the West being looked up to and admired as the model to adopt, China is rapidly taking center stage, to offer the world a different vision: revolutionary red communism-socialism. In fact, it is already happening. SOEs are popping up all across the world economy. In 2014, 23% of the Global 500 companies were SOEs, compared to only nine percent in 2005. This trend should continue into the 21st century, since China has shown that its economic model is clearly superior to Western colonialism. If Baba Beijing can bring the Chinese Dream to full fruition, by the stated goal of Year 2050, humanity just might have a chance to survive after all. The next time someone starts regurgitating Randian, Chicago School, jungle capitalism tripe, hit back with the facts in this article and share its link We owe it to future generatons to bring down the Great Western Firewall and speak truth to power. Jeff J. 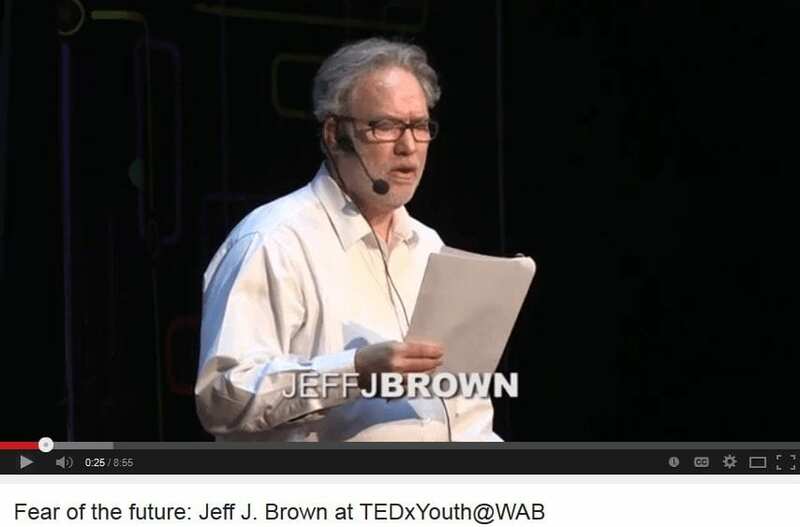 Brown is the author of “44 Days Backpacking in China: The Middle Kingdom in the 21st Century, with the United States, Europe and the Fate of the World in Its Looking Glass” (2013), “Reflections in Sinoland – Musings and Anecdotes from the Belly of the New Century Beast” (2015), and “Doctor WriteRead’s Treasure Trove to Great English” (2015). He is currently writing an historical fiction, “Red Letters – The Diaries of Xi Jinping”, due out in 2016. He is a member of The Anthill, a collective of authors who write about China. Apart from his columns to The Greanville Post, he also submits articles on Oped News and Firedog Lake. His articles have been published by Paul Craig Roberts, The Saker, Ron Unz, Alternative News Network, Russophile, 15 Minute News, The Daily Coin, Hidden Harmonies and many other websites. He has been a guest on Press TV. Get back at the lying, criminal mainstream media and its masters by reposting the truth about world events. If you like what you read on The Greanville Post help us extend its circulation by reposting this or any other article on a Facebook page or group page you belong to. Send a mail to Margo Stiles, letting her know what pages or sites you intend to cover. We MUST rely on each other to get the word out! And remember: All captions and pullquotes are furnished by the editors, NOT the author(s). A superb and much needed clarification of the Chinese “special situation”. There is no question that the party has made errors and run roughshod over many things, including the well-being of many workers in its march toward rapid industrialization, something inevitable considering the unrelenting imperialist threats against its hard-won independence from colonialism, but, overall, as the author points out, the proof is in the pudding, and the Chinese pudding is marching left! I have long hoped that both Russia and China, despite their tortured history in the 20th century, would emerge in this new century as the true vectors for a new world order based on far more genuine democracy and respect for the environment than anything the morally bankrupt west has to offer. My expectation is based on the fact both these great nations had a true socialist revolution, and in some aspects of society, the foreunners (and foretaste) of true communism. Conditions created by US-led global imperialism, which never relented, severely deformed the experiments, but the legacy is still there, not quite forgotten, and that’s why that germ may yet spawn a new wave of revolutions in this world. Indeed, capitalism has brought the world to such misery that even the Pope is now calling for RADICAL changes. Thank you for a great and hope-inspiring article. And compelling in its logic. Will force me to rethink some of my erstwhile assumptions. Whilst I do not concur with the author in all points, the trajectory of China speaks for itself. Thank you to everyone who got something out of this article. For those afflicted with doubt and internal conflict, what psychologists call cognitive dissonance, it takes years of de-brainwashing to finally see the world clearly and honestly. China is state-capitalist and claiming it’s socialism doesn’t do anything but harm the future of any revolutionary movement. I fight for a dictatorship of the proletariat, not Xi Jinping and the CCP.